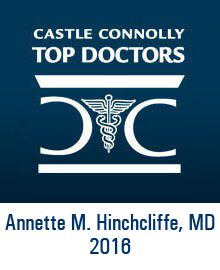 Dr. Hinchcliffe named "Top Doc" by Castle Connolly! We are proud to announce that Dr. Annette M. Hinchcliffe has been recognized as a Top Doctor by Castle Connolly for the 4th year. This honor recognizes doctors who provide the highest standard of care in their field of medicine.